If you have any questions about this Policy or our privacy practices, please contact us using the information provided below. Please take a few minutes to review this Policy. By accessing or using this Site, you are agreeing to the terms of this Policy. IF YOU DO NOT AGREE TO THE COLLECTION, USE AND DISCLOSURE OF YOUR PERSONAL INFORMATION AS SET FORTH IN THIS POLICY, PLEASE EXIT AND DO NOT USE THIS SITE. This Policy may be supplemented or amended from time to time by “privacy notices” provided at the time we collect your Personal Information, which may include “country-specific notices” that apply to information collected from individuals within certain countries. As examples: certain pages of this Site may contain privacy notices providing details about the Personal Information we collect on those pages, why we need that information, and choices you may have about the ways we use that information. Our privacy notices are part of this Policy. What Personal Information Do We Collect When You Use This Site? If you make a purchase using the Site, we collect the information you submit when you place your order, including your credit card and shipping information. If you ship an item to another person, we collect the information you provide about that person, such as his/her name, address and other contact information. If you sign up to receive e-mail communications from us, we collect your name and e-mail address and any related information you provide. Information Sent to Us by Your Web Browser. We may collect information that is sent to us automatically by your Web browser. This information typically includes your IP address, the name and version of your operating system, the name and version of your browser, the date and time of your visit, and the pages you visit. Please check your browser if you want to learn what information your browser sends or how to change your settings. This information does not identify you personally (except in some limited cases discussed below). Generally, we use this information to improve this Site and make it more compatible with the technology used by our visitors. In most cases, we do not link the information sent by your browser to information that identifies you personally. However, if you have registered on this Site, we may link your IP address to information that identifies you personally. We may also link your IP address to personally identifiable information you submit in placing an order. We may also review our server logs—which contain visitors’ IP addresses—for security purposes, such as detecting intrusions into our network. If we suspect criminal activity, we may share our server logs with the appropriate investigative authorities who could use that information to trace and identify individuals. Generally, the information we collect using these Web technologies does not identify you personally. If, however, you have registered on this Site, we may link this information we collect using Web technologies to other information that identifies you personally. Supplemental Information. From time to time, we may supplement the information we collect on this Site with information from other sources, such as information validating your address or demographic information based on your zip code. We may also supplement the information we collect on this Site with information we collect through other channels. For example, if you call one of our phone numbers to purchase products or receive support, we may supplement the information you provide online with information we collect at the store. If you ship an item to another person, we collect the Personal Information you provide about him or her and will use that information just as we use your Personal Information. For example, we may add that person to our newsletter mailing lists. If that person does not wish to receive promotional communications from us, he or she may contact us using the contact information provided in each electronic communication and on this Site. We may share Personal Information collected through this Site with companies and organizations that perform services on our behalf, for example, companies that provide support services to us (such as credit card verification and payment processing services, online recruiting services, and Web hosting services) or that help us market our products and services (such as third-party web analytics firms and marketing consultants). We may disclose Personal Information when we, in good faith, believe disclosure is appropriate to comply with the law, a court order or a subpoena. We may also disclose Personal Information to prevent or investigate a possible crime, such as fraud or identity theft; to enforce or apply our online Terms and Conditions or other agreements; or to protect our own rights or property or the rights, property or safety of our users or others. We reserve the right to disclose your Personal Information as described in any privacy notice posted on the Web page where you provide that information. By providing your Personal Information on that Web page you will be consenting to the disclosure of your Personal Information as described in that privacy notice. As Described in a Country-Specific Notice. We reserve the right to disclose your Personal Information as described in any country-specific notice posted on the Web page where you provide that information. By providing your Personal Information on that Web page you will be consenting to the disclosure of your Personal Information as described in that country-specific notice. We respect your right to make choices about the ways we collect, use and disclose your Personal Information. In most cases, we will ask you to indicate your choices at the time we collect your Personal Information. You may change previously expressed preferences regarding how we use and share your Personal Information. If at any time you wish to be taken off our mailing lists, please contact us. Please provide your full name, postal address and e-mail address so that we can find you on our mailing lists. Once we have the information we need, we will remove you from our mailing lists as you have requested. Please give us a reasonable amount of time to honor your request. Likewise, if at any time you decide you do not want us to share your Personal Information with third parties for their direct marketing purposes, please contact us. Please provide your full name, postal address and e-mail address so that we can find you on our mailing lists. Please give us a reasonable amount of time to honor your request. Even if we add you to our “do not share” lists, you may still receive information, catalogs and offers from third parties with whom we shared your information before we processed your request. If this happens to you, please contact the third party directly and ask to be removed from its mailing lists. How Do We Protect Personal Information? We take reasonable precautions to provide a level of security appropriate to the sensitivity of the Personal Information we collect. For example, we use SSL encryption to protect your credit card information as it travels over the Internet. Although we use reasonable measures to help protect your Personal Information against unauthorized use or disclosure, we cannot guarantee the security of information provided over the Internet or stored in our databases. The Company is a U.S. corporation headquartered in the United States, although this Site may be run on servers in the United States or in other countries. The Company reserves the right to change the location of the servers from which the Site is run and where your Personal Information is stored and processed in its sole discretion. By submitting any Personal Information to the Company, you consent to such action by the Company. In addition, we may transfer your Personal Information to our service providers and others located in the United States or another country for the purposes described in this Policy. Different countries have different privacy laws and requirements, and some provide less legal protection for your Personal Information than others. Please know, however, that no matter where your Personal Information is collected, used, transferred or stored, if it was collected through this Policy, it will be protected by the terms of this Policy and any Privacy Notices, Country-Specific Notices or other agreements that apply to you. This Policy is part of our Terms and Conditions and, as such, shall be governed under the laws of the State of Ohio, United States of America, without regard to its conflicts of law provisions that might require the application of the laws of another jurisdiction. As we add new features and functionality to this Site, we may need to update or revise this Policy. We reserve the right to do so, at any time and without prior notice, by posting the revised version on this Site. These changes will be effective as of the date we post the revised version on this Site. They will apply only to the Personal Information we collect after we have posted the revised version. Your use of this Site following any such change constitutes your consent to the terms of the revised Policy. For this reason, it is important to review this Policy regularly. If we modify this Policy, we will provide a notice at the top of this Policy for at least thirty days after the new effective date. 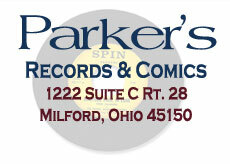 References to this “Site” refer to the Web site operated by Parker’s Records and Comics. The terms “we,” “us,” and “our” refer to the Parker’s Records and Comics operating the Site through which you accessed this Policy. The terms “you” and “your,” when used in this Policy, mean any user of this Site.